The gluten free market has opened the door to small independent producers being able to break through a market place that was and still is impenetrable. Big supermarket chain’s distribution and shelf space is only available for huge sums of money, unless it’s a new category that the public is demanding. This new revolution has been brought on by a processed food supply that has made people sick and tired enough to seek out new resources. It makes me wonder what other changes were the cause of the evolution of the food market to where we are today. 1914 100 YEARS AGO was a year of major change in the food industry, with a series of events that were more long lasting than typical. The beginning of major change in food supplies and production happened in the US, kick-started by WWI that had all of Europe in a raging war. 1. Refrigerators that used ammonia compression state-of-the-art technology instead of ice were utilized in Chicago stockyards and rail cars, bringing meat fresher and farther than previously available. 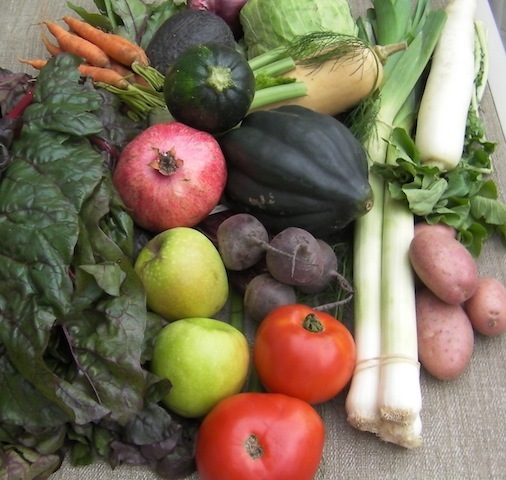 California produce growers used refrigerated rail cars year round. These markets expanded nationwide as oranges, melons, asparagus, lettuce and meat had greatly expanded shelf life and availability of these perishables were carried everywhere that rails stretched. Chilled became a reality, which was heightened in the ‘70’s when ‘Chill Out’ became a term, used to suppress politically incorrect passion. “Chill Out Man” was reinstated by The Dude in the classic cult film “The Big Lebowski” which is not to be missed and currently available on a cable channel near you. 2. The first pasta factory opened in the US: until then you bought dried pasta imported from Italy, made it yourself or bought pasta fresh in an Italian neighborhood. Italy stopped exporting pasta during the war and Vincent LaRosa and his five sons opened a factory in Brooklyn. It took the country by storm, being eaten at lunch and dinner. BTW pasta is never a main coarse in Italy, it’s a small serving (called Secondo meaning second coarse, surrounded by a lot of vegetables and a little meat). Italy has the highest rate of gluten intolerance in the world, and they do put out the best gluten free pastas that I have found to date. But more importantly: this was the beginning of baked macaroni and cheese that is still an American Classic and probably what led to the overload of arse brought on by so much gluten and processed cheese. 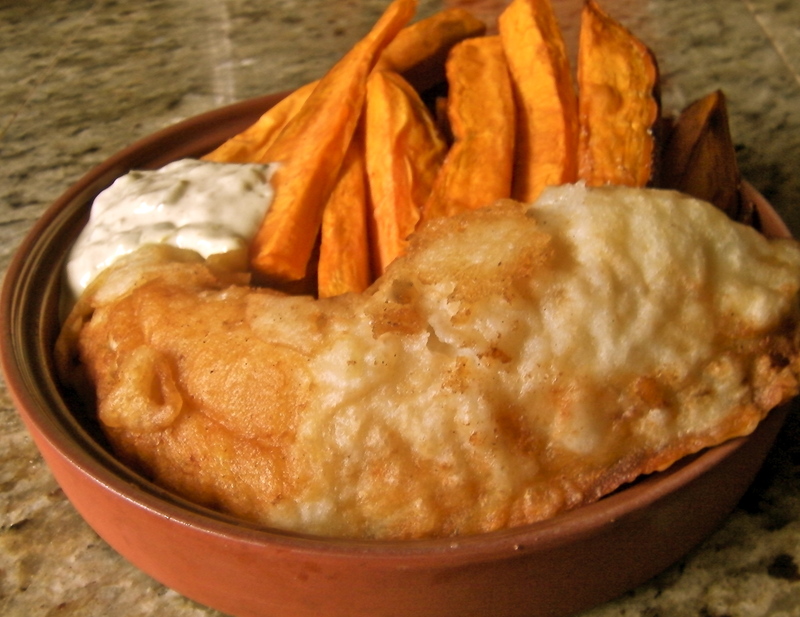 Gluten and Dairy Free Battered Cod with Baked Sweet Potato Fries. 3. Fish was shipped and railed to areas outside of the coastline in cans. Until Van Camp became a tuna canning company, fish was only available in markets close enough to the sea to remain fresh while on ice. Tuna was quite exotic and rare, so rare that the marketing plan called the product Chicken of the Sea to convince housewives to try it. Jessica Simpson took it into the MTV World when her reality show (a part of what the 21st Century has contributed to our culture), as a newly wed she said: “I’m confused is it chicken or is it fish?” while grocery shopping holding a can in one hand and her then husband Nick on the cell phone in the other, and this is why she is a big star today. Peanut Butter and Rice Noodles are the start of Cold Sesame Noodles which are my adult gluten-free version of a peanut butter and jelly sandwich. 4. George Washington Carver suggested that legumes be planted to restore nitrogen to the soil. 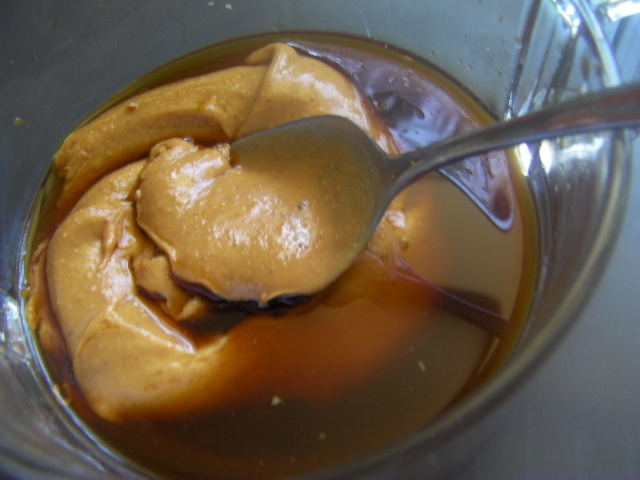 Although often credited with the invention of peanut butter, which goes back as far as the Aztecs, he was an agricultural chemist and a tireless advocate of the benefits of the peanut plant. As cotton crops had been destroyed by the boll weevil, his research showed that the soil on Southern Farms had been depleted of nitrogen from the cotton crops and his research proved that peanuts and sweet potatoes could replenish the land. Thus inspiring the peanut butter industry, easier to sell than peanuts in those dirty little shells, unless you’re a bar where people drink and munch and dump the shells on the floor: good for cowboy boots but keeps high-heels wearers out of your patronage. BTW I love sweet potatoes with peanut butter together, a little maple syrup and Hersweetie Herblends blended in while the potato is hot? Thank you George Washington Carver, thank you so very much. 5. Twinkies, Little Debbie, Drake’s Cakes were the original individually wrapped snack cakes produced by The Tasty Baking Company in Philadelphia. The ability to have a serving size of sweets without the entire process of baking a cake became one of the first ‘convenient foods’. Yes, these have been on the shelves for 100 years, and I have a feeling that the original stock might still be eatable. Who knows if these little packages of gluten, milk and sugar led us down the path to overload? They were a school lunch box convenience and an after school snack that was cheap and conveniently located at the cash register at every snack store on the walk home from school and sometimes lunch money went to dessert instead. Might have been the beginning of bad financial decisions for some of us. Food is in a constant stage of evolution but 1914 brought us change that is still with us today. Of course all success is based on the consumer ‘buying into it’. Don’t ever forget that what you buy represents your investment in not only the product but the way your market will grow. Look beyond the curtain of advertising and bold packaging, read the labels and see what is hidden in the box. What is a serving size for the calories listed? How much sodium and sugar is in a serving? Your food choices affect all of us, just another reason to choose wisely.